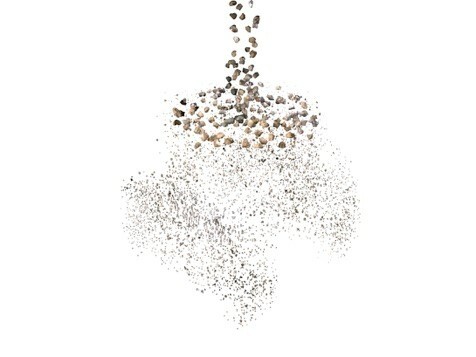 Today, VSI crushers – and the folks who rely on them – have produced many configurations to include everything from the addition of cascading material into the crushing chamber, to air swept separation of lighter product. One version suspends the shaft from above like a sugar centrifuge. It’s also one of the most feature-patented crushers, so some of the things mentioned here might be unique to a single manufacturer. VSIs apply a large amount of energy to crush material and that’s why it’s one of the most versatile crusher configurations today. View our VSI Machine Specifications, and get a quote today! When it comes to producing materials such as aggregate for road making, VSI crushers use a high-speed rotor and anvils for impact crushing rather than compression force for the energy needed for size reduction. 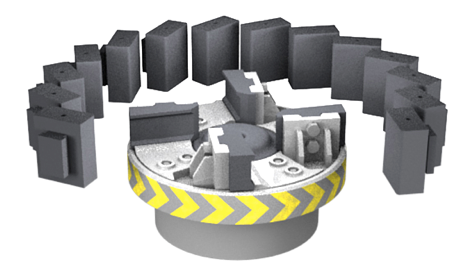 In a VSI, material is accelerated by centrifugal force by a rotor against the outer anvil ring, it then fractures and breaks along natural faults throughout the rock or minerals. The product is generally of a consistent cubical shape, making it excellent for modern Superpave highway asphalt applications. The rotor speed (feet per minute) controls final particle size. The VSI’s high cubical fracture percentage maximizes first-pass product yield and produces tighter particle size distribution. It has a high-throughput capacity ideal for beneficiation (elimination of soft material). Properly configured the VSI accepts highly abrasive materials. It has simple operation and maintenance. You can quickly change product size by changing rotor speed or cascade ratio. Some models have reversible wear parts to reduce downtime. The VSI typically has low operating costs even in high-moisture applications because of reduced energy costs and low wear cost per ton. There are some feed size limitations with a VSI because of the small feed area available in the center of the rotor. Tramp material in the feed such as gloves, tools, etc. can cause problems with imbalance. The high RPM and HP require careful balance maintenance such as replacing shoes on both sides of the rotor at the same time. High wear part cost may be a problem for some hard abrasive materials, but the VSI may still be the best option. Major limestone applications are for Superpave asphalt aggregates, road base, gravel, sand and cement. Industrial uses include: corundum, corundite, ferro silicon, glass, refractories, silicon carbide, tungsten carbide and zeolite. Mining applications include: bauxite, burnt magnesite, iron ore, non-ferrous metal ore, perlite and trona sulfate. VSIs are excellent for everything from abrasive materials to waste and recycling applications. Feed size and characteristics will affect the application of a VSI. The feed size is limited by the opening in the center of the rotor. Normally less than 5-inch material is desired, but very large VSIs can handle up to 12-inch feed. Another feature that will affect application is moisture, which can make the feed sticky. Required production capacity is the final limiting criteria. Large primary horizontal shaft impactors can output up to 1600 TPH and more. 1000 TPH is about the maximum for a VSI because of the limiting motor size and the rising G-force of a high-speed rotor, which is calculated by multiplying the radius times the square of the RPM. Shoe configurations are many: rock on rock, groups of rollers, special tip wear parts and many others. The metallurgy of the shoes is also highly varied. Rotors can have three to six shoes. The number of shoes is typically governed by the diameter of the rotor. 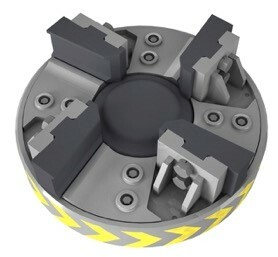 The larger the diameter rotor, the more openings are possible. Computational Fluid Dynamics (CFD) mathematical models are utilized to simulate the flow and collision forces to reveal solutions for lower wear cost, consistent final product, and higher energy efficiency. The material to be crushed is fed into the center of an open or closed rotor. The rotor rotates at high rpm, accelerating the feed and throwing it with high energy into the crushing chamber. When the material hits the anvil ring assembly, it shatters, and then the cubical shaped product falls through the opening between the rotor and the anvil and down to the conveyor below. The rotor speed (feet per minute) controls final particle size. Speeding up the rotor will produce more fines, slowing it down will produce fewer fines. 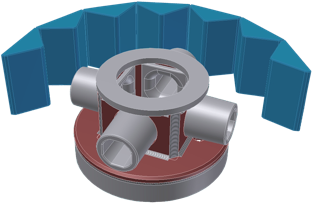 The typical VSI is fed, from above, into the center of its rotor. The material is then flung across an open void to the crushing chamber. It then impacts the outer anvil ring. This crushing action imparts very high energy to the material and is very effective on most types of material. It gives a very uniform and consistent grade of product. 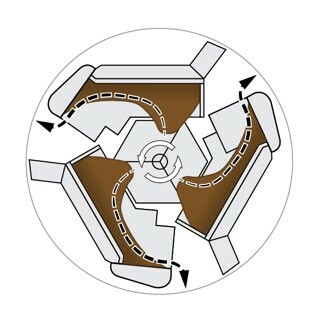 In cascade feeding, material bypasses the rotor and enters the crushing chamber from above. It’s called cascade feeding because as material fills up a large feed bowl, with an outer diameter larger than the outer diameter of the rotor, it spills over the side and falls into the crushing chamber from above, bypassing the rotor. 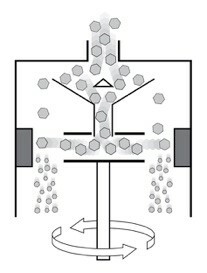 The effect of increasing feed through cascade is similar to slowing the rotor. Cascade feeding in amounts up to 10 percent may have no effect on particle size distribution or quality. 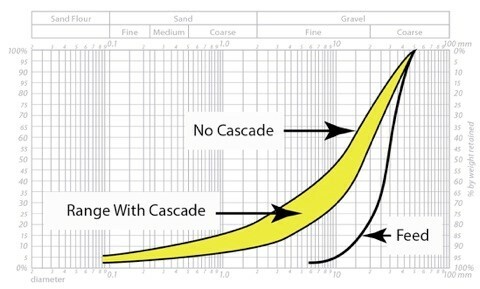 The product gradation curve and product shape will change, if an increased amount of cascade feeding is used. The VSI features multiple rotor/anvil configurations for various applications. From open or enclosed rotors to the tubular rotor, each machine is configured for their unique application. In many cases the rotor table, rotor assemblies, anvil ring or rock shelf are interchangeable, allowing maximum application flexibility. The open top metal rotor is good for large feed or medium to very hard material, but it will work best for softer materials. It can handle medium abrasive, dry or wet, but not sticky materials. High reduction ratios are common, which are excellent for sand and gravel production in closed loop systems. Shoe shape can change the production size range. A straight shoe face design produces finer product, and a curved shoe face design produces coarser material. The tubular rotor creates higher tip-speeds, which increases first pass yield with tighter particle size distribution and also reduces the recirculation loads. One unique feature is that the rotor rotation is reversible, allowing wear on both sides of the tube. Rotating the tube itself one-quarter turn also doubles the wear. 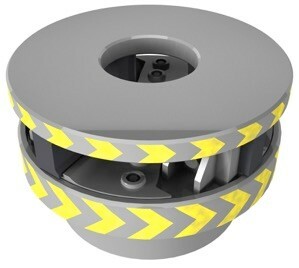 The enclosed top plate on a rotor primarily prevents material from escaping from the top of the rotor, which could happen with an overfed open top rotor. Any time the material or rock is used as an impact wear surface the term autogenous is used. Putting a top on the rotor table and shoes allows autogenous use. During operation of the VSI, a bed of material can be designed to build up inside the rotor against each of the shoe wall segments. The bed, which is made up of material that has been fed to the rotor, extends to a wear tip. The bed protects the shoe wall segment from wear. Concerning the rock shelf anvil, it forms a near vertical wall of material upon which the accelerated material impacts. “Rock-on-rock” crushing reduces maintenance but can require up to 30 percent of material recirculation before meeting size requirements. Also, the rock shelf anvil absorbs energy that could otherwise be used for breaking, which may reduce efficiency. More RPM may be needed to achieve the same result as a solid metal anvil. Good for medium abrasive materials, rock-on-rock configurations of either or both rotor and anvil may produce consistent material with low-wear cost and can handle wet but not sticky conditions. Reduction ratios from 2:1 to 5:1 can be expected. It’s widely used for quarried materials, such as sand and gravel. 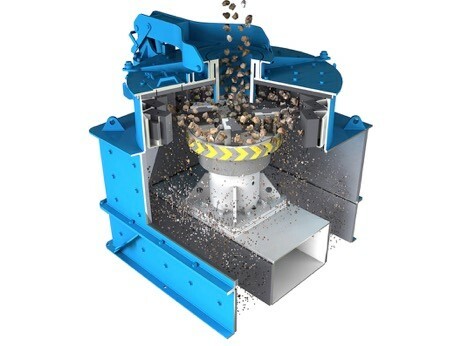 Due to the many configurations of the VSI feed, rotor, anvil and open- or closed- system design; testing is the only way to ensure proper application of a VSI crusher. The VSI is one of the most versatile crushers available on the market today. Even with some limitations, like feed size and output capacity, VSI features have been and continue to be developed to maximize first-pass yields and lower operating costs. If you test your process on full-scale equipment before choosing your VSI, you won’t be disappointed. Eric Marcotte joined Stedman Machine Company and its affiliate Innovative Processing Solutions in 2010. He has a Mining Engineering Degree from the University of Kentucky. Stedman Machine Company works closely with its customers to determine the best, most cost-effective, efficient size reduction method and equipment for specific applications. Stedman’s line of equipment includes: Cage Mills, Grand Slam™ and Mega Slam™ Horizontal Shaft Impactors, V-Slam™ Vertical Shaft Impactors, Hammer Mills, Aurora Lump Breakers, Micro-Max™ and Vertical Roller Mill Air Swept Fine Grinders. Stedman operates a complete testing and toll processing facility staffed by experienced technicians with full-scale equipment, allowing customers to witness accurate crushing test results, predicted output capacities and processing data. Support services include system design and 24-hour parts and service.